Lake Erie College’s historic campus is located in Painesville, Ohio. If you are interested in things that go bump in the night, this campus is for you! 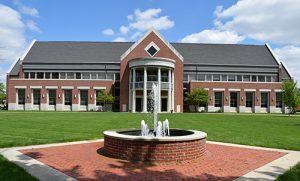 A center for paranormal activity, Lake Erie College claims to host apparitions in various locations across their beautiful campus. As much as we would like to share all the stories, this post will explore only one. Legend has it that sometime in the mid-1800s when Lake Erie College was an all girls school, a student named Stephanie had begun her studies. Somewhere along the way, she had an affair with a professor and became pregnant. 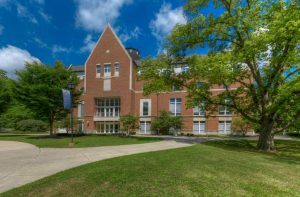 When he refused to marry her she became depressed and, on one fateful evening, hung herself on the fourth-floor bell tower of College Hall, the oldest building on campus. 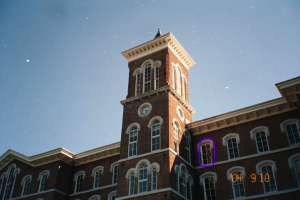 After her death, students began to report seeing her glowing white figure in a fourth floor window of College Hall. They claim she peers out the window, perhaps in search of her lost lover. The floor was often seen illuminated by dim, flickering lights late at night and students below spoke of hearing footsteps and occasional wailing from the floor above even though it had been closed and locked tight. Service workers entering the floor were occasionally frightened enough to refuse to ever return. Even TV paranormal ghost hunters investigated the fourth floor. One took an interesting photograph – check out the circled fourth floor window in the picture above. As if that wasn’t enough, students claim that Stephanie occasionally leaves College Hall in search of entertainment. There is a cracked mirror in the Social Parlor in the nearby Morley Music Building. Stephanie has occasionally been seen walking out of the mirror, dressed in eveningwear, on her way to an evening performance. After curtain calls, she returns through the mirror from whence she came. So, if you ever visit Lake Erie College, plan to take in a performance in Morley Music Building. Perhaps order a beverage and wander into the Social Parlor. Check out your eveningwear in the standing mirror on the far side of the room. Just don’t be disturbed if someone else is looking back at you. On your way to your car after the show, glance over your shoulder at the 4th floor of College Hall and bid Stephanie a good night. 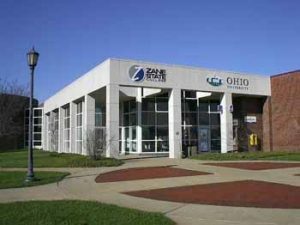 This is our last Ohio college ghost story for this Halloween season. We hope you have enjoyed the ride. Next year there will be more thrills and chills as we feature four more tales of the paranormal from our Ohio colleges. Happy Halloween! Legend has it that some students became a bit preoccupied with seeing how high they could launch themselves from the highest diving board in The Greenhouse. On one fateful evening, one student apparently launched himself high enough that he smashed through a glass pane in the roof and, after nearly decapitating himself, fell into the pool below. 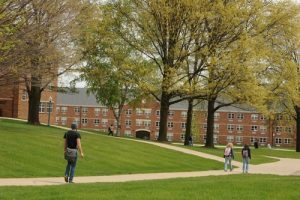 While administrators at Kenyon can find no record of such a student or incident, other students, faculty, and staff argue differently as they believe this student really never left. Over the years, most of the reports of what later became know as the “Greenhouse Ghost,” were told by custodians and safety officers. Their encounters typically occurred well after normal working hours. For example, the sound of a body impacting the water followed by thrashing sounds was commonly reported. When officers investigated or turned to face the pool, they would see disturbed water, but no one in the pool. Then, upon turning around again, they would see a set of wet footprints along the walkway leading away from the pool. Others would report that they would hear the sound of a diving board bouncing not once, but three times. Upon turning toward the board, they could see the board vibrating, but no one near it. In the 1980s the building was converted to a dance studio. 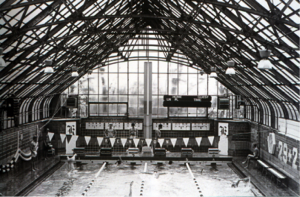 During construction the pool was drained and covered over by a false floor and the conservatory roof was replaced with a wooden, beamed roof more appropriate to its new use. Unfortunately, the Greenhouse Ghost never got the memo as the activity continued. Staff members continued to tell stories of late night encounters when they would become sensitized to the presence of the spirit. Some nights they would hear footsteps behind them as if they were being followed. On occasion they would, once again, hear the sounds of splashes and bouncing diving boards. Even more unnerving was the periodic appearance of wet footprints across the dance studio floor. Paranormal experiences in “The Greenhouse” are still reported to this day. So, if you ever visit Kenton College, you might stop by Shaffer Dance Studio, stroll across the dance floor, close your eyes, and listen. Then, just before you leave, look back over your shoulder for any wet footprints on the floor. You never know! 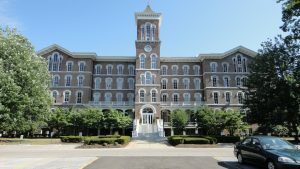 In 1868 the Sisters of Saint Mary of the Springs, a Dominican Order of Catholic Sisters, moved from Sommerset to Columbus, Ohio. A benefactor had donated land to the sisters in the hope that they would build a Catholic School in Columbus and educate his five daughters. Work was immediately begun on the new school, which opened in 1871. While donations and other funds had been sufficient to pay for the building, the sisters had to borrow $10,000 at 8% interest to furnish the new academy. The winter of 1871 was brutal and central Ohio lay under a blanket of snow. One evening a terrible blizzard pushed into the area making travel difficult. It was on the worst night of the blizzard that a dark, horse-drawn sleigh made its way up the gravel road leading into Saint Mary of the Springs Academy and stopped at the front door. A well-dressed man and woman stepped out of the coach, walked up the snow-covered steps, and pounded on the two large wooden doors demarking the entrance to the Academy. Two sisters responded and invited the strangers inside. The visitors explained that they had come to inquire about enrolling their two daughters in the Academy. Since they expected to travel abroad, they offered to make cash payment for a year’s board, tuition, and other expenses. The sisters accepted the daughters on the spot, knowing that these funds would be sufficient to cover past due bank payments and prevent foreclosure on the Academy. Documents were completed and the sisters were paid. This was happy ending to a dire situation. The academy became current with the bank, enrollment increased shortly thereafter, and the Academy was safely on its way. However, as you might have guessed, there is more to the story. The two daughters who were to arrive at the school in January never materialized. Furthermore, all attempts to contact the parents proved futile. It seems that their address did not exist and no one in their hometown knew them. Even more interesting; on that fateful snowy night; the one that saved the Academy from financial ruin, none of the local livery stables recall providing services to the coach or its occupants. 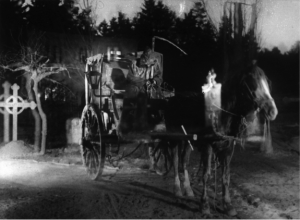 It was as if they had come from nowhere and departed to the same. 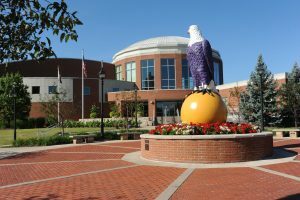 Saint Mary’s Academy has evolved over time and is now known as Ohio Dominican University. The institution has endured a number of financial crises during its life, but has always found a way to thrive. It seems ODU enjoys its own set of…. Guardian Angels.